Carlos Salcedo has joined his compatriot Marco Fabian to become only the third Mexican to feature for Eintracht Frankfurt. Joining home-town club Guadalajara at a very young age, Salcedo picked up the trail of his grandfather Manuel, who had played at the club in the 1950s. When asked once about his allegiance to Chivas, the younger Salcedo replied: "My blood is red and white because of my grandfather." Salcedo found it tough at the start to adapt to his new sporting surroundings, and left the club to join Tigres at 13 years of age for personal reasons. In Monterrey, he progressed through the youth ranks, but never succeeded in breaking into the first team. Believing his opportunities were limited in the youth teams of Mexico, he decided to look north in an attempt to fulfil his European footballing dream. Salcedo joined the Real Salt Lake academy in 2012, and qualified as a home grown player a year later, before signing a full contract with RSL in January 2013. Tenacious and uncompromising, the man aptly known as 'El Titán' swiftly broke into the first team, and was soon regarded as one of the best centre-backs in the MLS, aged just 19. He spent two seasons in the USA, making 25 league appearances, as well as finishing runner-up in the 2013 MLS Cup and the Lamar Hunt US Open Cup – the 100th edition of the oldest ongoing competition in American association football – the same year. Salcedo claimed his time in the MLS was what helped mould him into the defender he is today. "I felt really good there and well adapted to the MLS. I learnt things there that I didn’t know from my time in Mexico because the football in the States is more similar to that in Europe. It’s a bit more physical, more dynamic and you play against more complete forwards, which helped my defensive training." His improved performances did not go unnoticed across the border in his homeland, and Chivas were quick to bring Salcedo back home at the age of 21. He quickly developed into a first-team regular in Guadalajara and made the centre-back position his own. After 35 games in the red and white of Chivas, he was ready to fulfil his dream of a move to Europe. Serie A side Fiorentina made this dream a reality when they took Salcedo on loan for the 2016/17 season in August 2016. 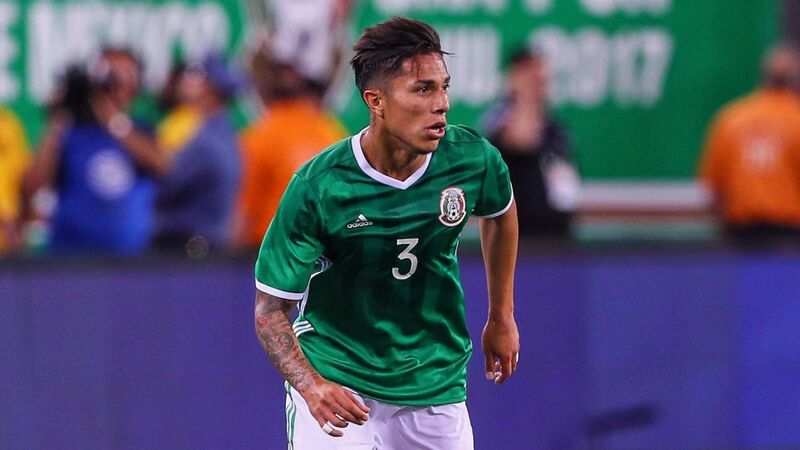 He became only the third Mexican to play in Italy after Miguel Layun and Rafael Marquez, and made his debut for La Viola in a tough draw against AC Milan. Salcedo went on to make 18 appearances in Florence, featuring regularly during the first half of the season. He was less prominent after the winter break, however, and when he did play, was often deployed at full-back. Salcedo was included in the Mexico Under-21 squad that won gold in the 2014 Central American and Caribbean games in Veracruz, Mexico. The centre-back has been a regular at all levels of the national team since then, as well as being a member of Mexico’s Rio 2016 Olympic Games squad. He made his senior international debut against the USA on 15 April 2015, and currently has 17 caps to his name, having featured in the Copa America and finishing fourth at the FIFA 2017 Confederations Cup. Salcedo, now 24, joins international teammate Fabian in the Bundesliga, continuing a curious theme of mirrored career paths. The pair, as well as former Bayer Leverkusen forward Javier 'Chicharito' Hernandez, were all born and raised in Guadalajara, as well as all coming through the Chivas academy. Watch: Salcedo settled quickly at Eintracht, as bundesliga.com found out at the club's media day last summer!